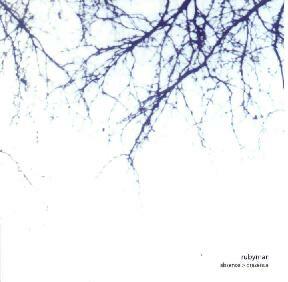 Rubymar - "Absence > Presence"
Debut by a San Francisco group that has been playing around for a couple of years now, although I have yet to see 'em. It's a nice listen but it also may be a little too much of a case of "spot the influences" on some tracks, especially the mix of minimalist rock, whiny vocals and electronica on the tracks "Calm Before the Storm" and "Abandon Working Title" both of which are pretty much dead ringers for the more recent Radiohead releases. The other tracks ("In Ribbons", "Sandoval") use mellow, melodic guitar lines and build into heavy wall of sound and back down again. Sure, it's been done, but it's still a nice trick, and Rubymar do it well. They even make some pretty fine ruckus on the breakdown in the middle of "Faultlines", kind of recalling Mogwai when they get heavy. The vocals are a bit whiny/strained in an emotional way at times but they go along fine with the music, and while this doesn't blow me away or anything it goes down pretty smooth. They seem like a shoe-in for college radio. For more information you can visit the Rubymar web site at: http://www.rubymar.com. Contact via snail mail c/o Edward Hajarian; 1394 19th Ave. San Francisco, CA 94122.